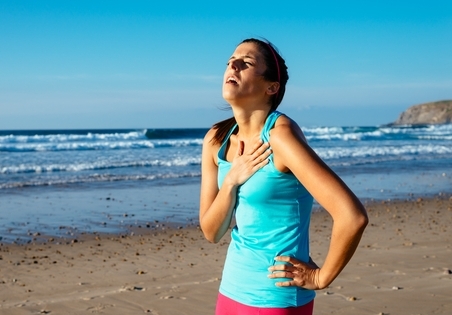 Asthma can sometimes be life threatening. The information on this page tells you what to look for and what to do if there is an asthma emergency. has blueness around their lips. Call an ambulance by dialling 111. Remember, the ambulance can give oxygen and provide much safer transport than you can in a car. Don't panic. Keep the person calm and comfortable while acting confidently and without delay. Follow the four-step asthma emergency plan. Sit the person upright. Loosen any tight clothing. Stay with the person. Remain calm and reassuring. Give six puffs of a reliever, usually a blue inhaler (Respigen, Salamol or Ventolin). Ideally give one puff at a time using a spacer. After each puff ask the person to take six breaths from the spacer. It there is little or no improvement, repeat steps 2 and 3. If there is still little or no improvement, continuously repeat steps 2 and 3 while waiting for the ambulance. If you have had an asthma emergency, consider asking your doctor to help you complete an asthma attack recovery plan. Written by HealthInfo clinical advisers. Endorsed by community respiratory physician, Canterbury DHB. Page created May 2017.